AetherBound is a Shoot Em' Up game where you control a sprite. 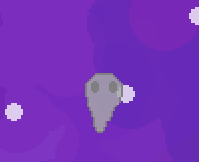 this sprite when hit by enemy attacks will then take on whatever element it was hit with, and with that you can shoot and attack the enemy! however, in this state, if hes hit again with the element he is weak to, he will then lose his elemental ability to have to gain a new one! Eventually, while fighting, a big old boss will come in, for massive points when you defeat him! press escape to pause the game and get the controls. This project was made in cooperation with Jordan Dube https://dillyball.itch.io/ on the wonderful music, and Drunk Shark https://drunk-shack.itch.io/ with some sprite work. I managed the project, coded the game, made sound effects, and i made some of the sprites.